Today is Friday, June 17, 2005. As I'm typing this it's only 8:00 p.m. but I'm completely exhausted. Ok, so I was a little tired yesterday. I got as far as writing one sentence! This whole week was spent getting up really early and driving to Monterey (about an hour distance) for a piping school. It was an interesting experience. Piping in one form or another all day long. I didn't get all that much time to practice my competition tunes, so in that respect, the school didn't help much. Today I could have slept in but woke up at 6 a.m. regardless as my body has now been programmed! Ah, well. My in-laws are visiting, so my father-in-law Ron Foster came along for company to the Campbell Highland Games. We arrived about 8:50 a.m., after about a half hour drive, giving me about an hour before my events. The weather was mostly sunny with a cool breeze—an improvement of the tiny bit of drizzle at home earlier. I chatted with Tom Jenkins (who won the 2/4 March at Mt. 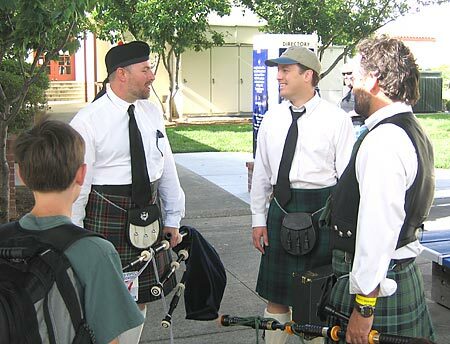 Tamalpais last month), as well was Paul Llewellyn from the band, and a number of other pipers I've met. Tom asked if I remembered to bring his medal and score sheet from Mt. Tam, but I'd left it by my computer! Oops. Monterey, next month. Jay Salter, my instructor, called last night with a request that I help Mike Lindelsee, a student of Jay's, with tuning and preparation since it was his first competition. I met with Mike, he had done some warming up and it was still at least half an hour until his event, so I went and warmed up myself. My pipes felt pretty good, and the chanter sounded good. (Mark Saul had retaped/taped every single hole on my chanter for a group piping session at the piping school earlier this week, so I had to retune the whole thing after, of course. A few days ago, Ann Gray had said my D was still off, so had I adjusted that and it seemed to hold.) Mike approached me when his event was 10 minutes away and I retaped his chanter. High-A and E were sharp, some low hand notes seemed a slightly flat, but I wasn't about to get that deep into retaping with only a few minutes to do it. Sounded pretty decent, so off he went. While working on Mike's chanter, I couldn't help but feel the irony, him telling me that he couldn't tell whether his notes were off on his chanter or not. Six years ago, I was in Mike's shoes. Channing, a Grade III piper, another student of Jay's, had tuned up my chanter and drones for my first event when I had no clue what I was doing. Now I, on the verge of Grade III (hopefully), was doing the same to for someone else. I returned to getting ready and warming up for my first event. The judges were switched from the schedule that had been e-mailed out, so instead of playing for Seamus Coyne, I was to play for Collin Berta. There was also some shuffling of the competitors as Sean Campbell was late, so Paul Llewellyn and myself ended up playing before him instead. We were playing at Platform 1, the same location where I was judged by Jan Richey last year. I gave Collin my tune (he is one of the younger judges that I've seen) and since Paul had just played the same tune immediately before me, I told Collin he was getting a "double dose" of the tune. He smiled. After the irregular comments on drone tuning at Mt. Tam, I changed my tuning method a bit. After tuning the outside tenor to low-A, I've been tuning the drones to each other while holding an open D on the chanter. Seems to work pretty well for my ear's current level of experience and/or my blowing technique. I got the drones as close as I could. Sounded perhaps a touch off, but it was hard for me to tell. I turned toward the judge, made eye contact and off I launched into the tune. Playing away on my Slow March for Collin Berta. I felt probably the best I've played, nerves-wise. I was confident. Didn't miss any notes, embellishments were clean, tempo felt even. When I was done, I figured I was pretty easily into the playoffs. I talked to Tom after playing and he said it had sounded good. I told him I thought the tuning might have been a bit off, at which he said that when I was facing away it sounded perfect but when I turned around it sounded off. He figured it was a result of the sound bouncing around since the competition area was between buildings, with reflective surfaces on three sides. - Nice bass drone sound, full. Great drones overall. - B-B-lowA movement @ end of bar clipped. I'll note here that while at the piping school, I played my competition tunes for Ann Gray. She said my technique/embellishments were "quite good" but it was time for me to work more on the music aspect, though this comment was in regard to my 2/4. She mentioned that the B near the end of the phrases in my slow march I should be holding longer. I'm assuming that this was what Collin was talking about regarding "rushed." Not quite sure about "C-B-lowA" unless he's talking about rushing here too, in which case I'd probably agree. As for the comment on the chanter being sharp, I tend to not pay too much attention to these things. As I've said in the past, solo chanters can't be sharp or flat. Notes on the chanter can be sharp or flat, but otherwise, it's just a matter of taste. I know the chanter (Low-A) was in the range of 475 Hz. That's a common band pitch these days, so it wasn't unreasonably high, especially considering it was a cool day. (Hot days shoot the pitch way up.) Another judge could think it's flat. Or another would be fine with it. It's just what they are used to. There's no rule saying your pitch has to be 470 or 466 or 480. Nonetheless, some judges write such things anyway. As long as it doesn't affect scoring (no way for me to know), I don't see a problem there. After the slow march there wasn't much time, I had to be over to Platform 3 for the 2/4 March to be judged by Jack Lee. (Yes, that Jack Lee. The pipe sergeant of the World Champion Simon Fraser University Pipe Band, solo winner of several top international events, including the Glenfiddich Invitational in 2003. Very famous!) I have to admit I was a little taken aback at the thought of playing for Jack Lee. As Tom Jenkins kidded, "It's like giving a physics lesson to Einstein." Later Tom told me he jokingly apologized in advance to Jack before he played—Tom had met him before at a piping school. Jack was very pleasant and friendly. As I walked up he told me he was going to stand in the sun while I played and not to get freaked out, he was just cold in the shade. When I told him my tune, he offered that this was the same tune he played for his first competition. I tuned up, and tuning felt very good. I started tapping out a beat with my foot, and launched into the tune, trying to keep it a little slower than last month. I still ended up playing it faster than I should have, unfortunately. While all the pipers were hanging around waiting for results, I met Gary Kirby, the piper who had placed a bit higher than myself in a couple events at Mt. Tam. Gary is a young piper, 17-ish I'm guessing, who's in the Prince Charles Pipe Band (Grade III). I think that explains why he hadn't entered the Piobaireachd event at Mt. Tam; the P.C. folks up in the San Francisco area aren't big on anything other than typical band material (i.e. "light music"). Tom, Mike and I were hanging out waiting to hear about results and playoffs when we were told that there wasn't going to be any playoffs. I remember there had been some discussion of this around the association. Grade IV is a heavily populated grade. 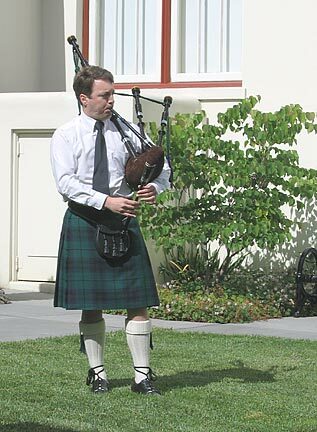 For instance, about 25 pipers were signed up for each Grade IV event at Campbell, which were broken into two leets. As Tom mused, in Grade III, sometimes you practically just show up, beat one person and you get a medal! As a result, there's been a push for giving more medals out in Grade IV by considering each leet a complete unique event, each with a 1st, 2nd, 3rd place. I'm a bit mixed on the concept. Without playoffs, it seems unresolved. You are left with two winners for Grade IV slow march, for instance. A little odd. Shooting the breeze while results were compiled. From the left: Mike Lindelsee's son Ian, Mike, Me, and Paul Llewellyn. We made our way over to the registration tent and happily found that Tom had taken 3rd place in the 2/4 event. We were pointed to the schedule board with all the placings marked out. I was shocked and got a sick feeling in my stomach. I hadn't medaled at all! (Ok, another bit of irony here. Shocked that I didn't medal.) I was at least a bit relieved to see a "4" circled on my 2/4 judging sheet, that is, one place behind Tom. I was still reeling a bit about the slow march. I had felt really confident with it, though I have to say, I didn't hear the other pipers play. Sigh. Ah, well. At least, I knew that I played pretty darn well and I was happy with my performance. I had presumably lost it on expression and not technique or any dumb errors, which is a bit of a surprise. Paul placed a few points higher than I did in the slow march, Paul is continuing to improve. Mike finished respectably with a score of 69 in his only event, the slow march. Ron and I were in his car and on our way back to Santa Cruz by 11-ish. I called and left a message with Jay telling him that Paul and I got skunked and that I'm going to have to get a bit more serious and start recording myself. I got a call back from Jay a couple hours later with a "What happened?" It's Jay's feeling (and mine) that I should be placing in every event these days. Success breeds expectations! He said placing 3th then 4th in the 2/4 at two competitions was consistent, but the slow march should have been better. We'll see what we can do in the next six weeks or so before the Monterey Games. Regardless of how things turned out, it was an enjoyable day. The competition was quick—we were in and out in about two hours (plus fairly brief travel, of course). I played reasonably well with no absent-minded mental errors. I tuned my drones spot on. I got to meet Jack Lee. (Heck, even Ron walked over later and introduced himself to Jack when I wasn't looking.) I got to hang around with other pipers I that know. Time to get more technical with the music timing and stop coasting in that respect. Jay and I will be picking apart my competition tunes when he gets back in town. Next up . . . Monterey!